Pibroch of Glasgow another godforsaken. 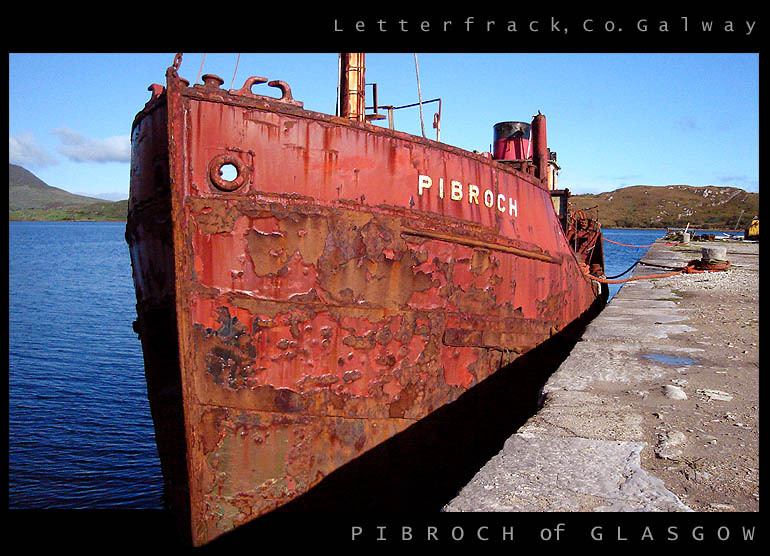 The Pibroch was built at Bowling, Scotland, in 1957 as a diesel engined boat for the Scottish Malt Distillers Ltd, and since 2002 has been lying at Letterfrack, County Galway, Ireland, in desperate need of restoration. Rusty Spotting Theme on TLens. Pibroch is one of them. Hi Janek, I like your pov where the perspective changes the form of the boat. It looks so huge in the front, just like if it were coming out of the pic. It brings also the details in the texture and the colour made by the corosion. Great work! Yan. I will try to participate to your theme. Details are so sharp it looks like its coming straight at you. Good POV good starkness linear focus and up close. Well shot! Way to do it. A fine photo indeed! Hi JAnek. I realy like the colors contrast and composition. Very weel executed. Regards, Jean. Nice shot. Composition is very good, colors and lighting are perfect. I like perspective and texture... but it makes me afraid for the sea when i see such a rusted boat ! Very well seen and done. Excellent POV and framing. Beautiful colours and textures. Very impressive. Wow a supershot Janek. What a superbe comp. Colors and lighting and sharpness are great. Jobe well done. Perfect POV. Good details and lights. Well done. Thanks for sharring. Very nice pov color and details..well done tfs..
Nice color contrast of red from the rusting ship & blue from the sky. Tfs! A great looking picture of this old boat. I like how the pattern of the rust is kind of reflected in the pattern of the pier. Centrali zdjęcie się bardzo podoba. A great nautical shot; and good detail on the rust/peeling paint as well as the stone or concrete on the right. Wonderful colors and POV; love how the bow of the boat pushes into your frame. Details and textures are absolutely brilliant - the metal texture and rust on the ship's hull really come out well! And range of tones are splendid. Belle photo, nettet�, jolie composition, belles couleurs, bien r�alis�e, pour moi j'�vite trop d'�critures autout du cadre, peut �tre ce sera meilleur. Merci pour le partage, salutations. Interesting POV; I like closed foreground; visual impact photo. Wow! The texture Don't call it rust! Call it relief as it's so evident! With the deep blue of the water to make a great contrast... Excellent! Rustbuckets are so interesting eh! some that I see around here! ;j.
I realy love rusty old things in pics. Nice sharpness and colors here. I also like the composition. Great stuff Janek, perfect colours, composition and framing. there is a great richness on this boat, the various layers of color attract me especially. Beautiful framing. It is excellent. Fant�stica imagen, con un colorido fabuloso. Muy buenos detalles. Buen DOF y estupendo BG. red,old and some blue tones..
real good color combination and great objekt and greath POV. Not the prettiest ship I have seen..! Nice point of view, good details are captured! Very good composition. Excellent colours, good perspective. Very sharp and in focus. This picture reminds me of a similar scene here in Canada, in a little town called Southampton, where a similar boat sit on the dock. Lovely colours in this shot, Janek. A pity they just leave the ship to rot away like this... what a pollution in the water it must be. At least you got an interesting shot out of it. It's a nice shot, composition and perspective are excellent, feels like boat is coming out of the frame, colors and lighting are perfect.